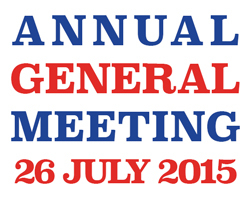 We would like to warmly invite all our current members to the Annual General Meeting (AGM), which will be held on Sunday 26th July 2015, from 11am – 12.30pm at Sokol (Czech House), 497 Queensberry Street, North Melbourne. We would welcome your attendance, and nomination for our committee. Nomination forms and proxies, in the case of inability to attend, are attached below. On behalf of VodaFest Czech and Slovak Association, I would like to thank you for your membership of our association for FY2014/15. As you might already know, our 5th VodaFest is to be held on Saturday 7th November 2015. More details to follow. All current members will gain free entry. There are also numerous opportunities for you to be part of the event through volunteering or sponsorship. All help is kindly appreciated and very welcome. Once again, thank you very much for your contribution to the success of VodaFest Czech and Slovak Festival, via your membership of our Association and attendance of our events. We look forward to seeing you both at VodaFest and our AGM. Secretary - VodaFest Czech and Slovak Association Inc. Submitted by Anonymous on Fri, 30/03/2018 - 5:19pm. Submitted by Anonymous on Thu, 29/03/2018 - 6:32pm. Submitted by Anonymous on Mon, 26/03/2018 - 6:22pm. Submitted by Anonymous on Sat, 24/03/2018 - 4:56pm. Submitted by Anonymous on Wed, 14/03/2018 - 2:27pm. Submitted by Anonymous on Mon, 26/02/2018 - 6:27pm. Submitted by Anonymous on Mon, 26/02/2018 - 6:19pm. Submitted by Anonymous on Fri, 09/02/2018 - 6:40pm. Submitted by Anonymous on Wed, 07/02/2018 - 5:14pm. Submitted by Anonymous on Mon, 29/01/2018 - 4:42pm. Submitted by Anonymous on Mon, 29/01/2018 - 4:31pm. Submitted by Anonymous on Sat, 20/01/2018 - 4:42pm. Submitted by Anonymous on Tue, 26/12/2017 - 6:50pm. Submitted by Anonymous on Tue, 26/12/2017 - 6:44pm. Submitted by Anonymous on Thu, 23/11/2017 - 4:57pm. I hope this information can help. Submitted by Anonymous on Thu, 23/11/2017 - 4:36pm. Submitted by Anonymous on Wed, 15/11/2017 - 7:31pm. Submitted by Anonymous on Thu, 09/11/2017 - 6:16pm. Submitted by Anonymous on Fri, 03/11/2017 - 6:25pm. Submitted by Anonymous on Thu, 26/10/2017 - 4:55pm. Submitted by Anonymous on Tue, 24/10/2017 - 6:25pm. Submitted by Anonymous on Sat, 07/10/2017 - 5:26pm. Submitted by Anonymous on Wed, 31/05/2017 - 6:09pm. Thank you for sharing this interesting information. Please also visit our blog, here you can get various interesting information about health and traditional medicine. Submitted by Anonymous on Thu, 06/04/2017 - 5:45pm. Cara mengobati alergi secara alami dengan manfaat herbal pilihan terbaik. Submitted by Anonymous on Mon, 13/03/2017 - 2:21am. Submitted by Anonymous on Wed, 25/01/2017 - 6:16pm. Submitted by Anonymous on Tue, 20/12/2016 - 5:30pm. Submitted by Anonymous on Wed, 07/12/2016 - 6:24pm. The information is very helpful for me. thank you! solutions and safe way to overcome various health problems with natural herbs you can see and read here. Submitted by Anonymous on Wed, 23/11/2016 - 5:26am. Submitted by Anonymous on Wed, 23/11/2016 - 5:24am. Submitted by Anonymous on Wed, 23/11/2016 - 5:21am. Submitted by Anonymous on Fri, 18/11/2016 - 7:52am. Submitted by Anonymous on Sat, 12/11/2016 - 6:07pm. Submitted by Anonymous on Fri, 11/11/2016 - 2:13pm. Submitted by Anonymous on Thu, 03/11/2016 - 11:36pm. Submitted by Anonymous on Tue, 01/11/2016 - 4:06pm. Submitted by Anonymous on Tue, 01/11/2016 - 2:25pm. Submitted by Anonymous on Mon, 24/10/2016 - 2:09pm. Submitted by Anonymous on Thu, 29/09/2016 - 4:33pm. penyakit mematikan yang satu ini. Submitted by Anonymous on Fri, 14/10/2016 - 1:13pm. Submitted by Anonymous on Fri, 21/10/2016 - 1:26pm. Eye Care Softgel a natural eye nerve medicine made from blueberries one of the world green home products that have exceptional khsiat in preventing and curing many diseases of the eye. Submitted by Anonymous on Sat, 17/09/2016 - 9:46pm. Submitted by Anonymous on Mon, 19/09/2016 - 4:09pm. Constipation is often considered mediocre, but if allowed to continue will cause a negative effect on health, including cancer-causing. Submitted by Anonymous on Mon, 19/09/2016 - 11:42am. Piles or hemorrhoids is one type of disease that is often experienced by many people. There are several ways to avoid hemorrhoid or hemorrhoids. Submitted by Anonymous on Mon, 19/09/2016 - 11:40am. Submitted by Anonymous on Sat, 17/09/2016 - 9:44pm. Submitted by Anonymous on Fri, 16/09/2016 - 1:47pm. Submitted by Anonymous on Fri, 16/09/2016 - 1:44pm.